Neither of the Broken Bells releases will cause you to question authority, reevaluate your identity, or question the role pop music can have in shaping geopolitics. Neither of the releases takes a nuanced, meteroic direction in music from which there is no going back. For a path down those roads, one may want to consider purchasing one of Bryan Burton’s (AKA Danger Mouse) other, more complex projects, or, to a lesser extent, one of James Mercer’s albums with The Shins. Neither Broken Bells albums will make it to a Music Appreciation course in a university, nor will they remind one of the simplistic brilliance found on any of the albums of The Beatles, but that isn’t what Broken Bells is about. They’re more about a study in the simplistic brilliance of pop music. If we could all conquer the simplistic brilliance of pop music, we would. Instead, George, John, and Paul… and sometimes Ringo, are held up as superhuman beings that once graced our planet with their combined talents. The simplistic brilliance they displayed on their early albums, taught the world that while we all know that brilliance can be defined by doing something more, it can also be achieved by dialing it back a could notches to those simple artistic statements, that can achieve something tectonic for the world to ooh and awe at for generations to come. As a person that is north of the casual listener, and not quite a Beatlemaniac, I have to imagine that the members of The Beatles wanted to add something more to the songs on their early albums. I have to imagine that their desire to write the magnum opus every time out was only contained by their desire to conquer the world with music, and that each song contained their brilliance, as often as it contained their brilliance. I have to imagine that there was some interplay between the members, and producer George Martin, that encouraged each member to push the boundaries of their era’s definition of pop music, but that those voices that called for some restraint were just as prominent. John Lennon, in particular, was known to have an unquenchable desire to write more complex, more experimental, message music. He apparently, wanted personal music that delved into his personal complexities, and he later came to despise a number of the more simplistic pop songs that he, and Paul, wrote to conquer the world. Creating pop music, it could be said, can be the equivalent of telling a joke, in that some people prefer their jokes to be cute, simple and funny. The old joke “Why did the chicken cross the road?” has a myriad of answers that say as much about the diversity of the base of that joke as it does the diversity of the joke tellers. Some of the punch lines, to this age old joke, are cute and simple. Those punch lines may make us smile but little more, but there is a certain satisfaction that cute joke tellers gain by making us smile. Others may prefer a clever twist on that age old joke, and they may repeat it to get us all giggling, and sharing it on Facebook. These people gain a certain satisfaction from their friends telling other friends that they heard it from them first. “Where did you hear that?” “I saw it on Jenny’s Facebook page.” Even though that clever twist of a punch line wasn’t ours, or we didn’t think of it, we own that joke among those people that heard it from us first. Others go for hilarious punch lines. These punch lines may reference prominent politicians, a reference to some popular starlet’s drug problems, or a reference to an historical figure. Hilarious, and poignant jokes of this type are not going to be received well by all, but the hilarious joke teller knows this is the price to pay for telling a complex and hilarious joke. It may provide some confusion, and it may be so far off the nose that those without a complex understanding of the issue at the heart of the punch line just don’t understand why it’s supposed to be funny, but to the joke teller this is worth it to avoid the universality of the cute and funny punch lines that evoke grins. Why some people go for the hilarious, as opposed to the cute and silly, may have something to do with their psychological complexity, that they’ve just heard so many jokes, for so many years, that they have to go beyond simplicity and silliness to get to some greater, and more complex definition of their identity? Or, it may have something to do with the fact that they don’t have the talent to execute simplicity in the manner some do, so they go beyond the norm to prove that they are more complex than those simple minded folks to avoid anyone asking the question if they have the basic talent to execute simplicity. 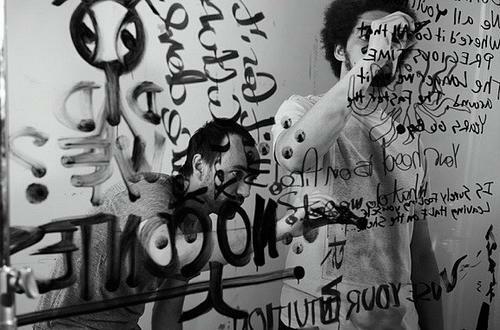 Bryan Burton, aka Danger Mouse, and James Mercer, of the Shins, have proven throughout their careers that they can produce some of the more difficult, complex, and challenging music available on the market. With these bona fides behind them, their current music challenges the notion that artistic brilliance doesn’t always have to be defined by doing something more, but in restraint and simplicity. While very few would compare either Broken Bells albums with any of The Beatles albums, the first Broken Bells album was a monument to the simplicity of pop music, a statement against the definition for more, bigger and better complexity, and the artistic thirst for the grand artistic statement that is complex and grand. Their second album, After the Disco is not nearly as earth shattering as the first, self-titled album Broken Bells album was, and it’s not as great as Bryan Burton’s album with Daniel Luppi simply called Rome, but it does continue with the theme that artistic brilliance can be pronounced through simplicity and restraint. The first, self-titled album of Broken Bells asks the artistic equivalent of the age old joke “Why did the chicken cross the road?” with the simplistic, artistic answer: “To get to the other side”. Some of us prefer the complexity, and we love to listen to those albums that challenge us to twenty to thirty rotations before we can fully grasp its artistic intentions, but even we admit that there’s nothing better than a brilliantly executed pop album that is short, and sweet, and composed with restraint in mind. Broken Bells and After the Disco may never cause you to slap a knee with appreciation, but their simplicity will definitely stick in your head in the manner most brilliantly composed simplicity does.